Ok, it’s not as bad as that paradox, but the amount of work remaining always grows when you get closer to the end. Still, I think I’ll be ready by the end of the week. Goal Box – done. I had to add collision detection for determining if a TargetSphere was touching (for setup) or inside (achieving the goal). I basically wrote an axis-aligned bounding box where the radius of the TargetSphere was either added (inside) to or subtracted from (touching) the size of the GoalBox. I’m not calculating penetration, just looking for sign change on the line segment. Added <map> of UI_cmd to handle commands coming from the control system and results coming from the sim. Worked right the first time. Yay, C++ templates! Enable/disable haptics/tactors – done. It’s interesting to see how the behavior and feel of the system changes with the different capabilities enabled/disabled. 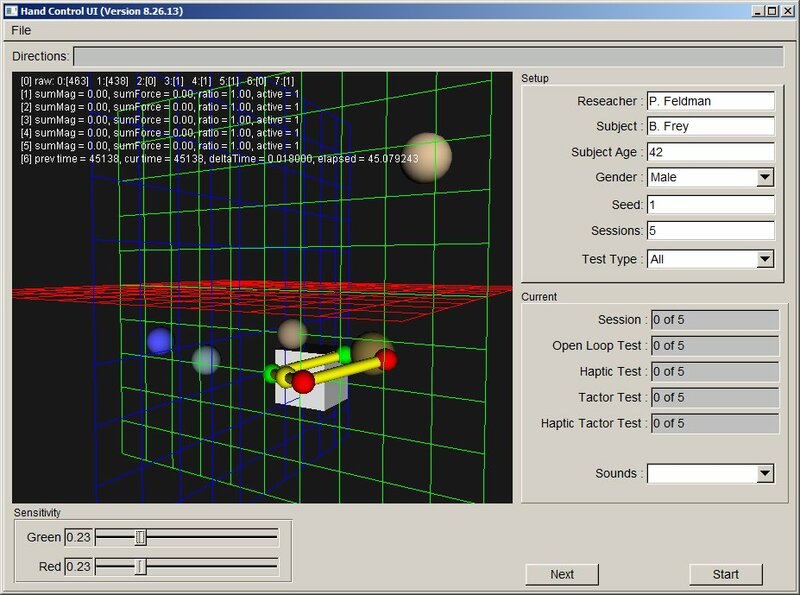 This entry was posted in C++, OpenHaptics and tagged bounding box, collision detection, line segment on August 27, 2013 by pgfeldman.